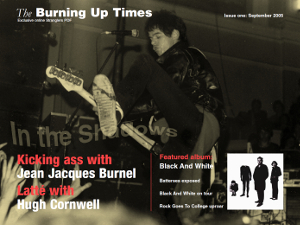 The Burning Up Times PDF magazines - download The Stranglers for free! 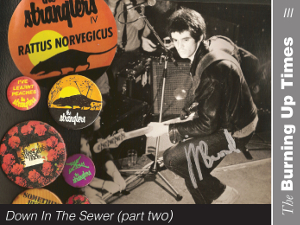 The Stranglers' controversy-o-meter goes off scale at Battersea, they go offstage on BBC TV, and go UFO while making the Black and White album. Immerse yourself in 1978 in our debut issue with exclusive interviews with JJ and Hugh and more. The Meninblack in trouble, in prison, on drugs, in riots... 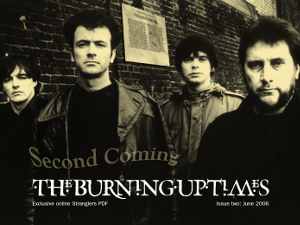 In this immense issue, Hugh and JJ look back on the making of the fifth LP and how it almost breaks the band. Studio producers, music writers and Stranglers fans give their gospel to that spectacular period of blackness! Jet Black recalls those early years; writer Barry Cain reminisces; photographers Chris Gabrin and Garry Coward-Williams recall; and Stranglers locations unearthed. And so it came to pass that the band recordeth and releaseth two LPs within months so we thought, let's do that too! Far too immense for one issue, let's have another one! 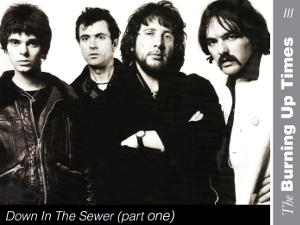 Down in the sewer once again: with publicity guru Alan Edwards, producer Martin Rushent and why he walked out of the studio, writers Chas de Whalley, Ronnie Gurr and John Robb, Lurker Arturo, Finchley Boy Alan, and more London landmarks. Phew! 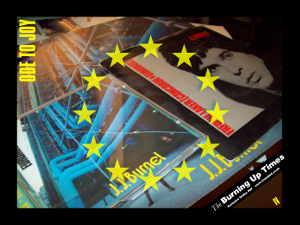 Stranglers' bassist JJ Burnel discusses his a Europolitical electronic solo album that comes stacked with Kraftwerk synths and brutal basslines. Kidnapped journalists and motorbikes too! We also reform Eurotour support band Rapid Eye Movement. So switch the clocks back to the future, for Euroman is about to Cometh in the 'fifth' and final issue of The Burning Up Times!